The capability to predict the nonlinear response of beams, plates and shells when subjected to thermal and mechanical loads is of prime interest to structural analysis. In fact, many structures are subjected to high load levels that may result in nonlinear load-deflection relationships due to large deformations. One of the important problems deserving special attention is the study of their nonlinear response to large deflection, postbuckling and nonlinear vibration. A two-step perturbation method is firstly proposed by Shen and Zhang (1988) for postbuckling analysis of isotropic plates. This approach gives parametrical analytical expressions of the variables in the postbuckling range and has been generalized to other plate postbuckling situations. This approach is then successfully used in solving many nonlinear bending, postbuckling, and nonlinear vibration problems of composite laminated plates and shells, in particular for some difficult tasks, for example, shear deformable plates with four free edges resting on elastic foundations, contact postbuckling of laminated plates and shells, nonlinear vibration of anisotropic cylindrical shells. This approach may be found its more extensive applications in nonlinear analysis of nano-scale structures. 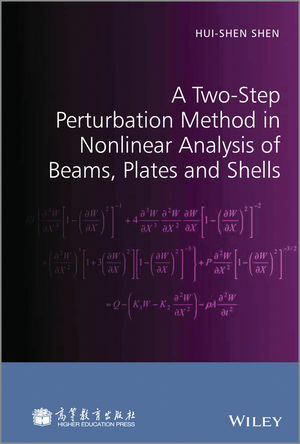 A Two-Step Perturbation Method in Nonlinear Analysis of Beams, Plates and Shells is an original and unique technique devoted entirely to solve geometrically nonlinear problems of beams, plates and shells. It is ideal for academics, researchers and postgraduates in mechanical engineering, civil engineering and aeronautical engineering.